There are those days when you feel life is just too bright and happy, prospects are too good, people are too nice to teach other. Watch this film, it will bring you back down. There has hardly ever been a film that treats family and parenthood so coldly, cruelly and truly, that dares to ask what a parent can do when he / she realizes that through all parental love, the fact remains that their kid is a bad person. I would expect most parents at some point develop a degree of hate against their ungrateful, obnoxious, annoying, dirty, omnipresent, always demanding, permanently crying children. If only for a minute, or for life, that will depend. But all parents, I guess, will feel terribly guilty about these feelings at some point. 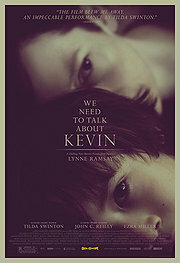 “We need to talk about Kevin” is about this guilt, and how you possibly can deal with it. Tilda Swinton’s character realizes that while her relationship to her son is failing almost from the very first day, she is unable, maybe unwilling, to give up on him. She puts effort and energy into him every step of the way, even when I as audience to this movie would long have asked for the form with which I can get separated from my child and send him to a foster home or a hospital. She takes punches for him even after she needs to, she is like the Irish sin eaters who try to relieve the just-deceased’s afterlife by taking their sins and burdening themselves instead. This is Tilda Swinton’s movie, she lives the role with this intensity and physique that can be matched by hardly any other actress working today. But Ezra Miller as older Kevin and Jasper Newell as the younger kid match her in their own way: the character is designed to be of almost Damien-like quality, but especially Miller makes sure that you keep believing this kid, you accept that he acts on some form of nihilistic philosophy. And both their sheer physical beauty creates a stunning contrast between their inner lives and outer appearance. This kind of movies is what cinema is about: provocative story, stylized in a way to reflect the characters’ inner conflicts, great actors that can hold back if needed, challenging ideas that are painful to think through. A stunning achievement, certainly one of the best films I have seen in the last couple of years!